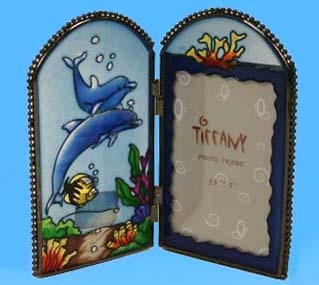 This beautiful Stained Glass Dolphin Picture Frame is the perfect decor for your beach house. Also a great gift for the dolphin and ocean lover. Quality design with artistic stained glass. Handcrafted with the finest details and materials, this piece of functional artwork will bring a lifetime of enjoyment. A wonderful gift for a friend or loved one as well! A treasure to last a lifetime! 6.25 inches tall and holds 3.5 x 5 inch photo.